A spokesman for Tunisia’s Popular Front coalition yesterday urged Arabs and Muslims to boycott American goods following US President Donald Trump’s decision to recognise Jerusalem as Israel’s capital. “The natural reaction from supporters of the Palestinian cause is to boycott American goods,” coalition spokesman, Hamma Hammami, said during a rally organised in support of the Palestinian cause in Tunis. 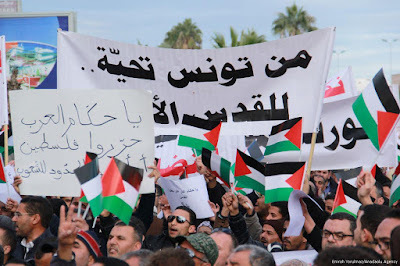 Leader of the Popular Front and Secretary-General of the Popular Current Party, Zouhair Hamdi, said the rally is a form of struggle to support the Palestinian cause. Hamdi stressed the need to expand and diversify the movements which support the Palestinian issue in order to sustain the momentum adding that there is fear that this push will fade. He called on the political parties represented in the Tunisian parliament to “ratify a bill that criminalises normalisation with Israel”.